There will be several other vendors set up as well…Rookies Cookies, local honey from Starlight, homemade soaps, Chef Walker’s Famous Barbecue and other produce vendors. Tomatoes will be the veggie of the day again this Wednesday! We have plenty available…lots of heirlooms too. We have now reduced the price per pound which makes them more affordable to enjoy! We have canning tomatoes available so be sure and let us know if you need us to reserve some for your home canning! Peaches are in abundance right now and we will continue to have them through the summer. 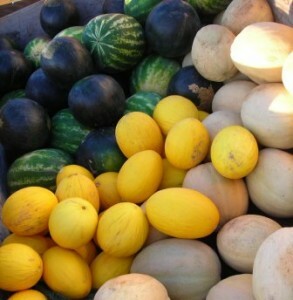 We have melons now… watermelons, cantaloupes and Canary melons… they are all delicious! Please be sure and order from this post and have your orders e-mailed by noon on Wednesdays. That way we know what must be harvested just for you.